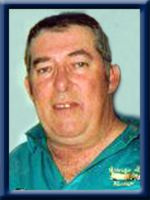 ROY – Reid M., 63, of Southwest Port Mouton, Queens County, passed away peacefully in Queens General Hospital, Liverpool on Tuesday, January 21, 2014. Born in Southwest Port Mouton, he was a son of the late Floyd J. and Edna (Fisher) Roy. Reid was a fisherman all his life. When he wasn’t on the water, he enjoyed camping, horseshoes, of which he and his father won many trophies. Reid enjoyed the Blue Jays and the Maple Leafs even when they were losing and went to Toronto with Mike and Robert to see his beloved Blue Jays play. Although he and Janie had no children of their own, their home and yard always had kids in it. He enjoyed his time volunteering at the West Queens Recreation Center catering and doing anything and everything the ladies asked. He enjoyed darts and a good game of crib. He was one of the first affiliate members of the Mersey Branch #38, Royal Canadian Legion, Liverpool and will always be remembered as a huge Elvis fan. He is survived by his beloved wife of 41 years, Valerie “Jane” (Fisher); sister Valerie Roy of Beech Hill, brothers Arnold (Judy) of Mersey Point and Floyd G. “Buster” of Port Mouton. His special niece Roberta (Michael) Roy of Southwest Port Mouton and great nephew Robert. He was predeceased by his sister Juanita Rosita Lloyd and nephew Joel Roy. I was so very sad to hear of Reid’s passing! I enjoyed very much my visits with you both – I always left your house laughing! My thoughts and prayers are with you during this sad time. Reid was such fun and will be greatly missed. to all the family.sorry to hear of reid passing.our sympathy goes out to all of you. Janie. So sorry to hear of Reids’ passing. My thoughts and prayers are with you at this difficult time. Sorry to hear of Reids’ passing. Keep his memories close they will help you in the difficult times ahead. How sad it is to lose a loved one, the pain is so great, but in time you do heal. You will always have those alone times and Reid will never leave you he will always be in your heart and in your mind. Our deepest condolences. Have faith and strength. Janie, we are so sorry to hear of Reid’s passing. So enjoyed the years You and Reid bowled. Thinking of you. Dear Janie: so sorry to hear of Reid’s passing. You will miss him for sure as you and Reid always seemed to have the loveliest “quality time” which those memories will stay with you forever and help you through this sad time. You are in my thoughts and prayers. God Bless. Thinking of you at this sad time,my thoughts and prayers are with you all. Janie sorry to hear of your loss our prays are with you!! We were so saddened to hear od Reid’s passing,He will be missed by many.We as everyone else considered him a true friend.Keep his memories close,as they will help you in these hard times.Our thoughts and prayers are with all the family.Our condolences to you all. Both shocked and saddened to hear of Reid’s passing. Please accept our sincere condolences. Dear Janie, so surprised and sorry to hear of Ried’s passing. I remember Ried as a torment as he would always tease me when I was little. He was always well thought of by both mom and dad and a lot of other people I’m sure.My thoughts and prayers are with you at this truly difficult time as well as Buster, Arnold, Valerie, Roberta and their families.God Bless You All. Dear Janie, so sorry to hear of your loss, may time help heal some …easy to say…not so easy to do, take care , Tish. Janie,Valerie, Arnold , Buster and all of your Families,we were very sorry to hear of Reid,s passing. May you find comfort in your memories.Our thoughts and prayers are with you all. My deepest sympathies to Janie and Roberta, as well as the rest of Reid”s family.Reid was a fun loving guy.He will be missed by all who kne him.My prayers and thoughts are with you all at this difficult time. I am so sorry to hear of Reid’s passing and send my condolences to Janie and the family. Reid and I have had many laughs over the years and at times in conversations I wasn’t sure if he was serious until he laughed. I am sure he will be missed by many. I am so sorry Janie. Janie – I was so sorry to hear of Reid’s passing … I will always be indebted to both of you for all your help all these years. I will always treasure and remember the fun we had each summer when I visited! You both were like a brother and sister to me! It was truly a difficult decision when I sold the “old house” … so many memories and you both were always a part of it! Reid will truly be missed by all! As I read thru everyone’s thoughts – the one thing that really stands out is Reid’s kindness to everyone and his wonderful sense of humor – his laughter!!! Janie, Valerie and Family. We were very shocked to hear of Reid’s passing. We remembered the good times we had playing darts with him. I know it is very hard at this time, but remember all the good times you all had with him. It will get a little easier with time, but there will be moments and that’s the time you have to remember all the good and the laughs you had. May god best you all and take care. We were sad to hear of Reid’s passing. Just know that there are many people thinking of you, so you are not going through your time of sorrow by yourselves. So sorry to hear of Reid’s passing. We are so sorry to hear of your loss. Reid will be missed. Take care and know that you are in our thoughts. So sorry to hear of Reids passing…you are in my thoughts and prayers. Reid always had a smile and a kind word….and sometimes a little joke….he will always be in your heart. My sincere condolences. We were very sorry to read of Reid’s passing and are sending our thoughts of sympathy to all of you. May he Rest In Peace and may God bless you all with strength and love as you travel this difficult road. We are so sorry for your loss. Your husband was like a big Teddy Bear with is laugh and his sense of humor. It was very clear how much he loved you Janie and how much you loved him, always looking out for one another. Please know that we are all thinking about you in your time of sorrow, and remember that Reid is still with you always. I’m so sorry and saddened to hear of your loss. Reid was always so kind to us when we would come up and visit. I’ll never forget how warm and inviting you both were during our summers in SWPM. Some how you guys always had the best Nintendo games and were always so willing to share. Even though we’d only see you and Reid every few summers, it always felt like visiting close family. Sending you lots of love and sympathy. Valerie, Janie and Arnold – very sorry to hear of Reid’s passing. My thoughts are with you. I would like to take this time to thank everyone for their kind words about our Reid.He had numerous nieces,nephews,aunts,uncles,cousins,friends whom he loved dearly,and of coarse the LOVE of his LIFE Janie,they were one together.There is a huge hole in our hearts,but the memories will keep us strong.Reid was a prankster even to the end: he pulled a fast one on us-that was Reid.So I just want to THANK-YOU BROTHER for the years we shared.—UNTIL WE ALL MEET AGAIN. LOVE, SIS, ARNOLD ,BUSTER. sorry to read about reids passing. i will miss his jokes and great sense of humor. prayers are with you janie. The family is missing the best prankster and joker of all. Reid was definitely one of a kind. My thoughts are with you all… Janie, Valerie, Arnold, and Buster. I’m sure Aunt Edna, Uncle Floyd, Juanita, Robert and Joel was your welcoming committee…you’re in good hand Buddy. Rest easy. I feel greatly for your loss and I am deeply sorry. Some of my best memories are of Nova Scotia and all the fun times we all had there. The both of you play a major part in those memories. Reid was always so welcoming and in good humor. As think back I can only see Reid with a huge smile on his face or making someone else smile in return. Reid will always be in my heart and cherished memories. So sorry to hear of Reid’s passing. Our deepest sympathy.Our thoughts and prayers are with you all. Reid R.I.P. Reid has left so many of us with wonderful memories. He had a sense of humor that made you like him instantly. I first met you and Reid over 30 years ago at Molega Lake Campground (great memories there) and I played many games of horseshoes against Reid and his dad. Whenever I saw Reid over the years he never changed and was always that friendly, funny guy that we all thought so much of. You are in my thoughts at this sad time! So sorry to hear of Reid’s passing, our thoughts and prayers are with you all R.I.P. Reid. We are saddened to hear of Reid’s passing. He was always Reid. What else can U say. He never changed, always had a comment or joke to make U laugh. We are sure he will be missed by all who knew him. Was sadden to hear of Reid’s passing thinking of you at this sad time. Janie and family. So sorry to hear about Reid. He was a wonderful man. He will be missed by everyone that knew him. Our thoughts and prayers are with you. Stay strong. So So sorry to hear of Reid’s passing. He was only 19 days younger than me. I remember how he used to love to play pranks on people. He was always fun. Just remember the good times you had and know Janie he did love you. Keep faith. We will always remember how welcoming both you and Reid were to our family. We regret that we were only just getting to know Reid, but it was obvious to us – even in that short time – that he was a man who was a good neighbour and a loving partner. We’ll keep you in our thoughts.